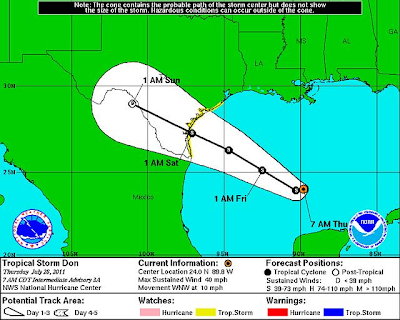 Summer Heat & Tropical Storm Don. 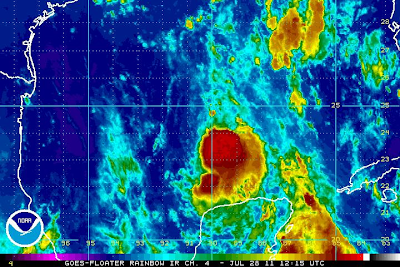 Atlantic Floater 1 (Rainbow) Satellite Image Of TS Don. Taken At 6:15 AM MDT This Morning. NHC Forecast Track Of Tropical Storm Don. 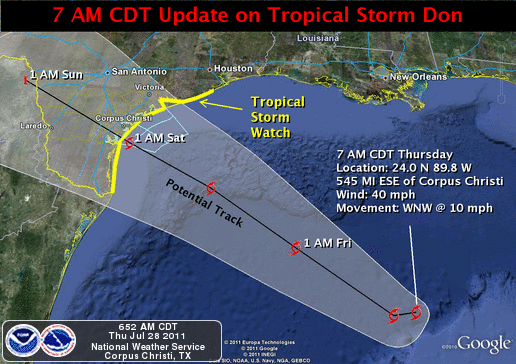 Map Is Courtesy Of The Corpus Christi NWS Office. 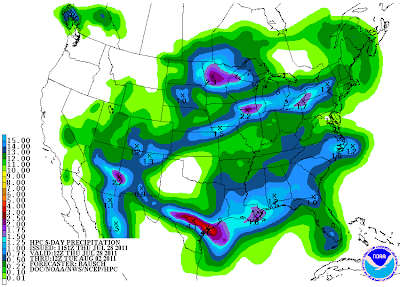 NWS HPC 4-5 Day Precipitation Forecast. Valid 6 AM MDT Today - 6 AM MDT Tue Aug 2, 2011.
will change daily as new model data becomes available. see the latest NHC updates for the latest on Don. moisture from Don, possibly as early as this weekend. could elevate the flash flood threat across the area. numerous t-storms will fire up over and near the mtn's.